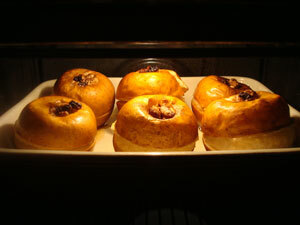 Pre-heat the oven to 180°C (355°F) convection heat. 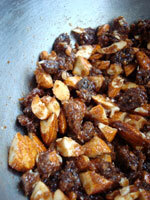 Add the chopped almonds, raisins, spices and brown sugar to the butter, stir well, set aside. Prepare the apples; remove the core. 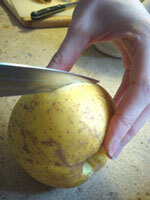 Using a sharp knife draw a line around the middle of each apple (see picture). 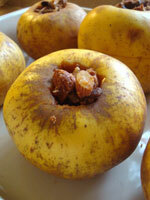 Stuff with the nut/spice mixture till it reaches the top of each apple. Cook for 45 -60 minutes (depending on the size of your cooking apples), until apples are very tender when poked with a knife. It was such fun to make this recipe with you and realize how quickly and easily you can have a delicious & very nutricious dessert! 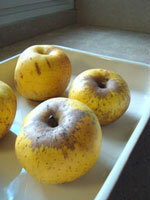 These apples were very tasty and really kept their shape.